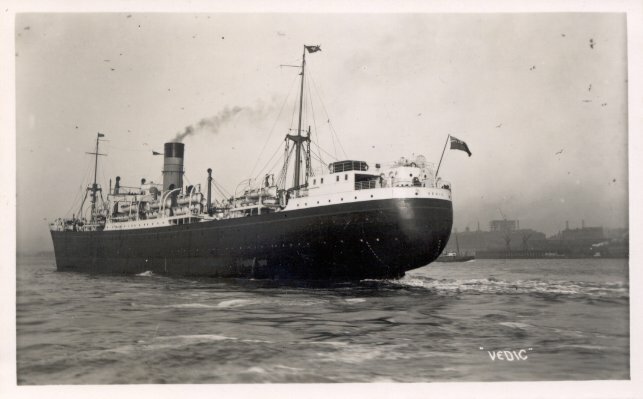 Notable for being the first White Star liner powered solely by turbine engines, Vedic was built by Harland & Wolff, Govan, and was engined at Belfast. Designed purely as an emigrant ship, with third class accommodations only, Vedic was commissioned and built without being designated for any specific IMM line. She was launched in December 1917 and fitted out as a troopship, rather than a passenger liner. Her maiden voyage began in Belfast on 11 July 1918, and took her to Boston, where she began her trooping duties. Vedic served under the Liner Requisition Act until April 1919, and in September of that year she was used to repatriate British troops from northern Russia. After a 1920 refitting, she was placed on White Star's Liverpool-Clyde-Canada emigrant service, although in 1921, her winter terminus was Portland, Maine, and her summer terminus was New York. 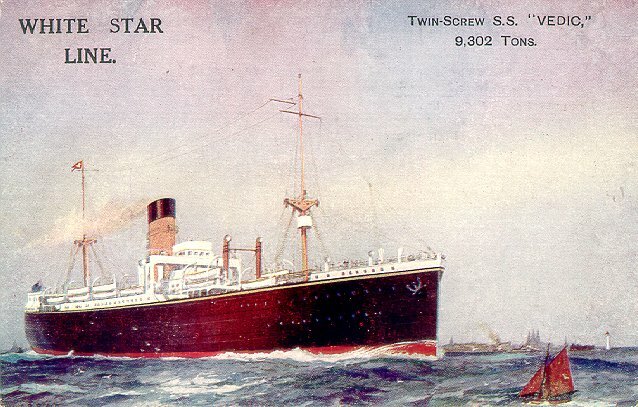 In 1922, Vedic and Red Star's Poland were placed on a Bremen-Southampton-Cherbourg-Canada service, which terminated at Montréal in the summer and Halifax in the winter. After a 1925 refitting, Vedic was placed on the White Star/Aberdeen/Blue Funnel joint emigrant service to Australia; she did considerable charter work for the Salvation Army, also carrying emigrants to Australia. When White Star and Cunard merged in 1934, Vedic was not transferred to the merged company, but was sold for scrapping at Rosyth. Sources: Moss and Hume's Shipbuilders to the World; Bonsor's North Atlantic Seaway; Anderson's White Star; Haws' Merchant Fleets.